The Dapper Bun: Happy Valentine's Day! Happy Valentine's Day, friend! I bought myself a pretty cymbidium orchid for the occasion. :-) I'm happy to share an interesting story about this red dress. I saw it in navy at the BR outlet a year ago and tried it on. I liked it, but for whatever reason (probably it was too expensive), I passed. About a month or two later, I traveled back to the store to return something and looked to see if they still had this dress. They did not so I said, "Oh well." A couple of weeks ago I was at the BR Outlet again and spotted this on the clearance rack. I asked the saleslady if it was the same dress as last year and she said that she believed so. Not wanting to risk chance again, I purchased it in red! I love the cowl neck and fitted silhouette. An extra special thank you for visiting on this love-filled day! Happy Valentine's! gorgeous. love those tights - i have the same ones. What a gorgeous look! I love your beautiful dress and the tights give it so much whimsy! Great cowl too! This dress is beautiful on you- I love the "vintage" feel of it! Happy Valentine's Day! GORGEOUS! 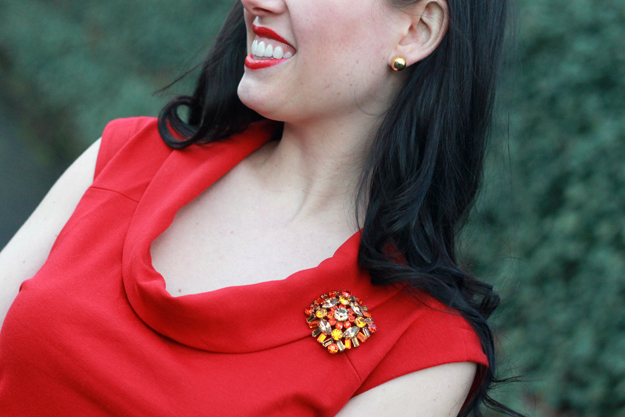 Fun leopard fur, cute polka-dot tights, classy red and a romantic brooch! You win with this outfit, girl! Happy valentines day Maryann. I love that red dress, and I am so glad that a year later, it was reissued and you got it on clearance! This is sooooo totally the perfect, glam vintage V-Day look. I looooove the lipstick red dress, esp w polka dots and cheetah print! you look amazing! LADY IN RED. GORG! xO! You look so classic in red and black Mary Ann! Super pretty!